The Strategic Growth Council announced in December five new projects funded under their new Climate Change Research Program. The program is funded by cap-and-trade auction proceeds. 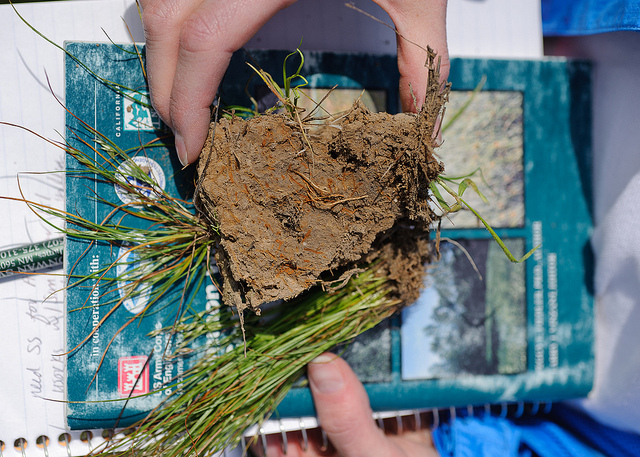 Of the projects awarded, $7.7 million will go to two projects focusing on soil and the role it can play in sequestering carbon in agricultural lands. The projects, although research-based, are equally committed to the development of economically viable technologies and practices that benefit growers and disadvantaged communities often disproportionately affected by climate change. The projects will address immediate issues in disadvantaged communities like air quality and lack of employment opportunities. The Collaborative on Climate Change Solutions, a collective effort by researchers from UC Davis, UC Berkeley, UC Merced, and CSU East Bay, will test rock, compost, and biochar amendments over a variety of soil types and regions and study their potential to increase soil carbon capture. The project will continue research conducted by Whendee Silver of the Lawrence Berkeley National Laboratory which has studied the effects of compost application on rangeland. In addition to investigating the effect of compost applications, the project will study applications of biochar and pulverized rock to rangeland and cropping systems. The answer he thinks lies in pulverizing the rock, thereby mimicking natural processes of weatherization and hastening the process by which certain rocks will absorb CO2 as they recrystalize. Rocks that contain silicate minerals, like basalt, consume CO2 and release minerals like potassium which growers like for soil fertility. Other rocks, like Gypsum, although not known to capture CO2, do enhance root growth which increases carbon storage and reduces nitrogen use by improving nitrogen use efficiency. It is symbiotic co-benefits like these that excite Houlton and add real incentives for growers. By working with growers throughout the state’s biggest crops, like almonds, which comprise 60% of California’s cropped land, and geographically strategic crops, like alfalfa in the Imperial Valley, Houlton hopes to appeal to grower’s most pressing needs surrounding yield and soil water holding capacity. “People like to say climate-smart agriculture, I like to say climate-solving agriculture. The co-benefits are climate-smart because they help with water and yields. They are necessary or else why would a grower do it? This is a real opportunity for agriculture to be a huge part of the solution. That is what I am most excited about,” says Houlton. Part of the excitement surrounding the project, according to Houlton, is based off a recent study suggesting that if basalt rock was ground-up and added to cropland around the world or 11% of earth’s surface, it would result in a drawdown of 4 billion tons of CO2 per year, approximately half of the United States annual emissions. Among the project’s partners are tribes, the American Carbon Registry, and compost and biochar producers. With an eye on incentivizing growers to adopt long-term amendment practices, Houlton hopes through their relationship with the American Carbon Registry to address some of the barriers currently keeping farmers from participating in the California carbon market. Professor Gerardo Diaz of UC Merced’s School of Engineering will lead a project focused on the development of mobile biochar production technologies to increase the amount of biochar accessible for dairies throughout the state. Manure management, which generates 34% of the agricultural sector’s emissions, is an increasingly big focus for the dairy industry as it works to decrease GHG emissions by 2030. According to Dr. Diaz, when added to composting manure, biochar can reduce methane emissions by 27%-32% while eliminating much of the problematic odor. By diverting agricultural waste streams, such as almond and walnut shells, and by removing dead ponderosa pines from the Sierras, biochar production reduces additional carbon emissions by avoided burning. Instead, these biomasses are burned at high temperatures in an oxygen-depleted environment, creating carbon-rich charcoal that remains stable in soil for thousands of years. Once added to composted manure, the biochar-compost mixture can be spread over cropland for increased soil fertility and continued GHG reduction as a soil amendment. Like Houlton, Diaz would like to see the project scale through innovation and economic sustainability. In addition to studying the effects of biochar applications on GHG fluxes in the soil, the project will create technology capable of producing biochar consistently at a large-scale. The technology, which will create a closed-loop system on farms by diverting green waste from burn piles and turning it into a potentially valuable soil amendment, has the capacity to create employment in rural areas and increase the profitability of farms if biochar can be marketed widely. A simple platform capable of being operated by a grower, or owned and rented by a grower to the larger community, is a goal of the project. “We are working with industrial partners that are very interested in making this a feasible industry. We want to have a product in the end that can be used to generate jobs and build economies,” says Diaz. The project seeks applications for the biochar outside the agricultural industry, partnering with groups like Professional Traffic Solutions to study the effects of biochar application to paved areas prone to heavy runoff.